Every time I change to another page in IE6 SP2, whether by using the back and forward buttons, clicking on a link, or typing a URL, there's a sound that plays. It sounds like a muffled explosion and it's annoying as hell. I checked all the assigned sounds in the control panel and there's no entry for IE at all, so there are none assigned to it through there. Where else can I look? I'd like to get rid of it, but even substituting a simple beep would be a big improvement. Actually you were looking in the right place - Control Panel, Sounds - it's just that it's totally not obvious which item you want to change. "...imagine Homer Simpson saying "D'oh!" each time you navigate." So "magic item #1" is that Internet Explorer takes some of its settings from Windows Explorer. And "magic item #2" is that the setting that controls the sound you want is called "Start Navigation"
You can now select different sounds for that setting, using the Sounds: dropdown beneath the list. One of those settings is "(none)" to turn is off completely. Alternately, you can use the Browse button to assign just about any ".wav" file to be played - imagine Homer Simpson saying "D'oh!" each time you navigate. Ask Leo! - "IExplore.exe has generated an error." Now what? Ask Leo! - How do I delete and reinstall Microsoft Internet Explorer? i have done this and have to do it every time i turn my computer back on as the sound reappears! have i got a virus or something? me too i turn it off just like this and i still get that little click, at this point when i go into sounds to turn it off, it's already off. I'm confused. thank you Leo, it worked for me. Guys, if not working for you, try to block popup sound too! I'm having the same trouble as the first two posters - I follow the instructions but when I go back into the Sounds applet, after clicking Apply and OK, it has reverted back to how it was, i.e. Windows doesn't seem to save it, or something else is over-riding it. Any suggestions on how I can fix this? Thanks, Russell. Great! This noise is really annoying when listening to online radios!! THAAAANK YOOOU! Thank you! Hopefully this puts an end to it. Such things drove me to FireFox long ago, but occasionally I do find myself in IE and now it will at least be bearable. 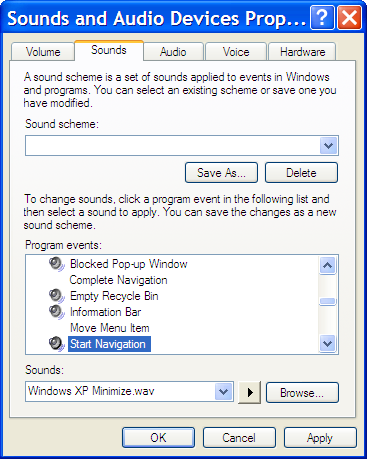 Notice how there are no pleasant sounds in the entire list of Windows sounds? 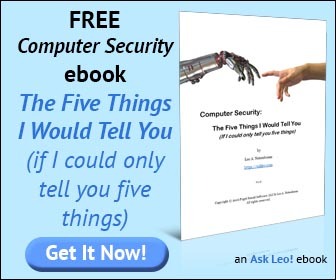 Thanks for the info Leo! Why on earth would we want these annoying sounds in the first place? We can already SEE WHEN WE HAVE CLICKED ON SOMETHING! Thanks. Worked first time. Dont we just love computers. Thanks! That has been irritating me for a long time, especially since that is supposed to be the sound Google Taskbar makes when it blocks a popup. I kept thinking... is something being blocked now? i've wanted to turn that sound off for years...my god my live has improved SO MUCH!! it was expecially annoying in hotmail...now if i could only figure out how to turn the noise off in outlook...d'oh! I'm a little confused here, because the remedy given here is not effective, and yet the administrator just seems to have dropped off. If I remember this site, and I may not.. I will provide the correct remedy when I have it. Thank you. how do u turn it back on ??? Yes this does work, but I am using Vista (unfortunately for me) and the process is just a little bit different but once you know the sound to change is "start navigation" then you can locate it. i found ibSilent, it turns off sound of flash adverts. Second time i've had to use this - I made the mistake of not having windows update off since i got the computer and it reverted the sound choice!